Get a good look at that face. 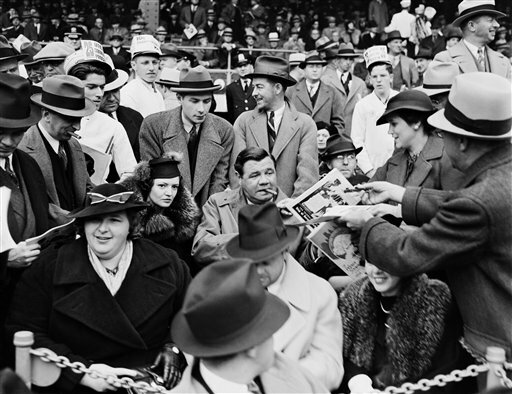 It is Babe Ruth, in a WPA photograph from 1936, taken at the Polo Grounds before or during the World Series, September 30. The year after Ruth called it quits was Joe DiMaggio’s rookie season: Lou Gehrig had a typical monster campaign. Although “King” Carl Hubbell, a.k.a. “The Meal Ticket”, and the New York Giants bested the Yankees in the first game, the Yanks won the second by a record 18-4 score, and went on to capture the title in six games. Ruth sits beside glamorous wife Claire, to his right (our left); and that’s Kate Smith in (our) left foreground (looking as if she could belt a few round-trippers herself, before the moon comes over the mountain). This entry was posted in Baseball, Yankees and tagged Babe Ruth, Carl Hubbell, Joe DiMaggio, Lou Gehrig, New York Giants, Polo Grounds. Bookmark the permalink.